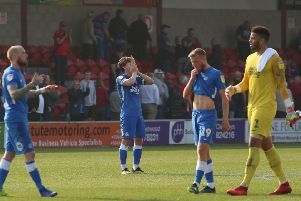 Angry Peterborough United manager Dave Robertson refused to defend his players after another poor performance tonight (September 1). Posh went down 1-0 at Millwall in the first round of the Johnstone’s Paint Trophy. They conceded a 92nd minute goal against a team who had won just one of their previous 21 matches at home. And Robertson pulled no punches after the game. “Losing 1-0 at Millwall is not good enough,” Robertson said. “And I won’t carry on defending my players. “Some of them didn’t work hard enough for the team tonight and that is very disappointing. “We still created plenty of chances though, but we are just not assertive in front of goal. “We then conceded a bad goal at the death. One that we should have been able to defend. “It wasn’t a great game, but it was one we should have been capable of winning. We had 14 or 15 good chances to score. “I spoke some honest words to the players after the game. They have to understand their roles in the team. “We have goals in the team from wide areas, but tonight they didn’t work hard enough for the team in those positions. “We started the game brightly, but we have to mantain those standards for 90 minutes. “The game was there for the taking if we had scored early. Robertson refused to use the loss of two of his starting back four as an excuse. Alex Davey left the field ill after 20 minutes and Ricardo Santos picked up a facial injury midway through the second half. Left-back Kgosi Ntlhe could return to the squad for the League One trip to Southend on Saturday (September 5).